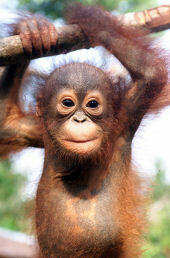 Cute, cuddly, gentle and endangered, that's pongo pygmaeus better known to the world as orang utan. They have a brown and rust-coloured shaggy fur. Orang utan means "the man of the forest" in Malay. In times past they didn't kill them because they felt the orang utan was simply a person hiding in the trees, trying to avoid having to go to work or become a slave. Orang Utans are the largest tree-living mammals and these fascinating and very human ginger apes gave rise to the legend of the Wild Man of Borneo. Females have a body weight of 37kg, and males weigh 83kg and their life span is about 60 years. The orang-utan lives in tropical, swamp and mountain forests, where it eats mostly fruit, leaves and insects. 1. in the past, capture for the pet and zoo trade, especially the capture of young, which usually involved killing the mother. 2. loss of habitat loss, especially through permanent conversion to oil-palm plantations and for logging. Orang utans are highly intelligent with an ability to reason and think. This large, gentle red ape is one of our closest relatives, sharing 97% of the same DNA as humans. The orang utan has the most remarkable ability to travel through the forest treetops. They make their home in these trees and build nests each night out of leaves and branches in the very tops of the trees. This is where they live and sleep - sometimes as much as 100 feet above the ground. The orang utan has little need to come down from the trees, as they are uniquely adapted for their arboreal lifestyle. Almost all of the food they eat grows in the treetops and the frequent rains fill the leaves thus supplying their drinking water. When water is difficult to get, they chew leaves to make a sponge to soak up water in tree cavities. When it rains very hard the orang utan makes an umbrella for himself out of big leaves. Sarawak has the biggest wild population of these threatened apes that are found only in Borneo and Sumatra. Shy and solitary by nature they are hard to see in the wild. They travel across vast ranges of forest browsing for fruit and making a new tree nest each night. Although second in size only to the gorilla among the great apes, the orang utan lives almost completely in the trees. Swinging from branch to branch takes enormous strength. 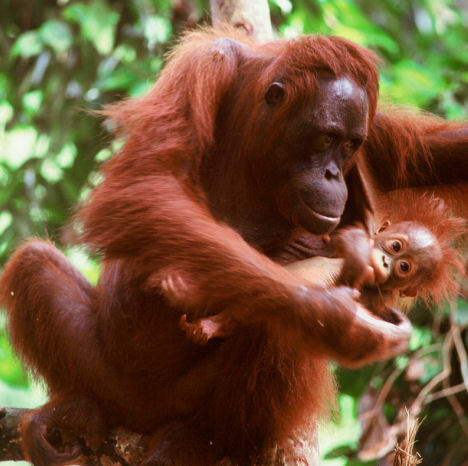 Orang utan females only give birth about once every 8 years - the longest time between births of any mammal on earth. This results in only 4 to 5 babies in her lifetime. This is why orang utan populations are very slow to recover from disturbance. Man's encroachment on their forest habitat, coupled with their low birth rate has seen a marked drop in orang utan populations, particularly outside Sarawak. Here they are totally protected and the population seems to be increasing. There are strict laws against keeping them as pets. Any found in captivity are confiscated and taken to rehabilitation centers at Matang and Semmengok, both near Kuching. Here they are taught how to fend for themselves in the forest before being released. These centers are the best places to see orang utan, both those under rehabilitation and ones that have been released but still return looking for handouts of fruit from the wardens.